T oday’s discerning traveller is looking for more than rest and relaxation. Faced with a dizzying array of choices, many globetrotters are seeking to go further afield, seeking truly transformative experiences. The Canadian Arctic is a dream destination—and expedition cruising offers the ideal mix of comfort, and adventure in the great northern frontier. 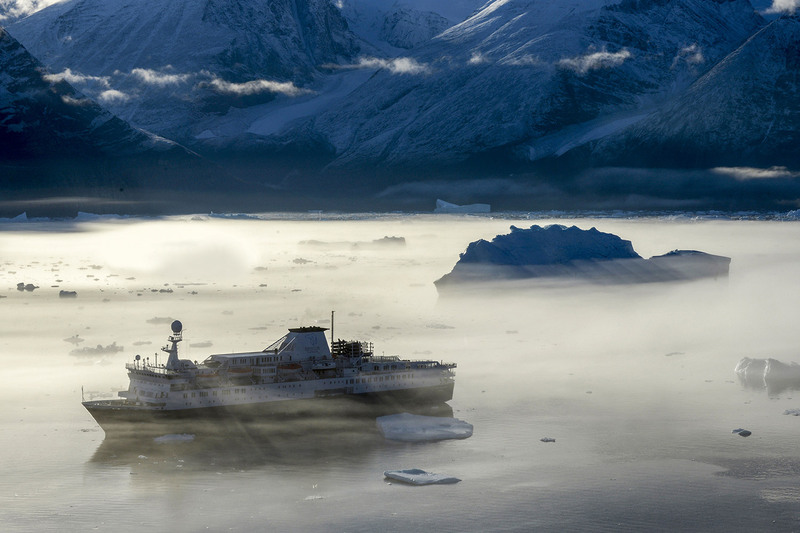 The idea may sound like a contradiction in terms, but expedition cruising in the Arctic—pioneered by the likes of Adventure Canada, based in Port Credit, Ontario—is a best-of-both-worlds scenario. Sleeping and eating aboard the Ocean Endeavour, an ice-class vessel customized for Arctic voyages, clients enjoy sufficient comfort to be up for an adventure every day—usually, a wilderness landing, wildlife sighting, or community visit facilitated by Zodiac. These 5.5.-metre rigid inflatable boats are equipped with outboard motors and driven by experienced guides. Safe, rugged, manoeuverabkle—and virtually unsinkable—Zodiacs get travellers to places they could otherwise only dream of. A typical excursion may include viewing polar bears, belugas, or even narwhals from the Zodiac. Or, passengers may cruise by Zodiac among calving icebergs. A beach landing in an Arctic hamlet may wind up in a square dance in the local community centre—with a feast of ‘country food’ harvested from the land to welcome guests. Adventure Canada’s version of expedition cruising is deeply rooted in education. While the 198-passenger Ocean Endeavour offers amenities like a hot tub, sauna, pool, library, and spa, the emphasis aboard is on learning. Veteran ornithologists, marine biologists, archeologists, botanists, and historians offer workshops, presentations, and panel discussions to enhance the travel experience with a deeper level of understanding of the territory. The arts are also a focus: bestselling authors like Margaret Atwood, Ken McGoogan, Michael Crummy, and Alanna Mitchell offer readings and interpersonal connection aboard. Award-winning musicians like Barney Bentall, The Once, and Ian Tamblyn enrich the evenings with song. Painters, including JC Roy and the influential Drawn Onward group, share their gifts. Filmmakers, such as John Houston, Julia Szucs, and Steve Smith —s well as the curators of the Polar Film Festival—show their works and lead lively discussions afterward. Perhaps the most important element of Adventure Canada’s expedition cruises is the cultural. Visits to the Inuit communities of Nunavut, Nunavik, and Nunatsiavut provides the opportunity to deepen connections with Canada’s northernmost citizens. But it’s one-on-one engagement with the numerous Inuit staff aboard—cultural ambassadors, expedition team members, Zodiac drivers, and bear guards—that truly sets the tone. Passengers arrive as curious visitors to Canada’s Arctic; they emerge as proud ambassadors for the Inuit homeland. Whether it’s the opportunity to spot seabirds nesting by the thousands on remote cliff faces, or to witness the mighty icebergs on Baffin Bay; whether it’s a visit to the Franklin expedition graves at Beechey Island, or a chance to square dance with the locals in Qikiqtarjuaq; whether you’re looking to land in one of Canada’s northernmost National Parks, or to taste freshly caught Arctic char…travelling by ship in the Canadian Arctic offers a travel experience unlike any other. Combining comfort, and adventure; hands-on experience and educational engagement; expedition cruising, Adventure Canada style, is art, science, culture—and fun—all rolled into one. Founded in 1987, Adventure Canada was created to bring travellers to Canada’s “blank spaces,” those areas whose remoteness alone made them special. Over the last thirty years, along with their guests, they have discovered that there is so much that is extraordinary about the places they travel, from the landscape, wildlife and culture to the history, art and archeology that is unique to every destination. It is their belief that there is so much to see “beyond the binoculars” that drives them to delve deeper into their favourite places with every expedition and continually seek out new destinations.